The latest issue of the annual edition of Knowledge@HEC, produced in collaboration with the team at Business Digest, has just been published. This new edition presents expert reflections, recently featured in the most prestigious international scientific journals, on marketing, management, finance, and strategy in a concise format accessible to nonacademic audiences. Management school research generally goes unnoticed by the professional world. And yet, that research plays a fundamental role in shaping business practices. To narrow the gap between research and companies, since 2008 HEC Paris has called upon Business Digest’s editorial expertise and knowledge of economics and management in the production of Knowledge@HEC, a publication that provides an overview of the research conducted at HEC Paris. The goal: increase the visibility of the scientific works published by HEC Paris’s faculty members by making them more accessible to a public not versed in the codes of academic research (technical jargon, modeling and simulation, and so on). 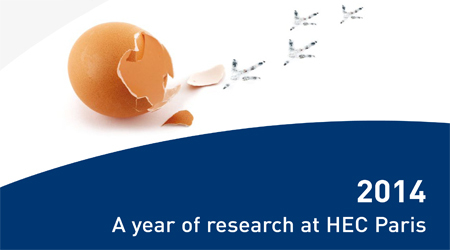 You can find all of the articles on the Knowledge@HEC website.